Another of the teenage members of the Williams Team throws in with the Dunderdale Juggernaut, thereby magnanimously putting an end to his own ambitions. VOCM News has learned that the province was very close to bringing in legislation that would have taken steps to improve safety of children and youth, but time just ran out in the fall sitting of the House of Assembly. It's a law which prohibits smoking in a private vehicle when a person under the age of 16 is present. There have been calls over the years for the government in this province to take such action, especially after Nova Scotia became the first province in the country to do so a few years ago. The particulars of the law vary from province to province, but most categorize the vulnerable as under the age of 16. The law will likely form part of the legislative agenda for the spring sitting. Awwwww. Time ran out. Poor things. If only the government had some control over how much or how little the House of Assembly sits. I see that Northern Harvest Ltd. has registered its proposal for a salmon hatchery in Stephenville, as required by law. The public has until Dec. 22 to comment and Environment Minister Charlene Johnson will make a decision about how to proceed on Dec 30. After speaking to people in Stephenville recently, I am left wondering why Northern Harvest even bothered to register this proposal. They have been proceeding with construction all along as though they already have all the necessary permits. So, Minister Johnson, would you at least please tell the general public now what other environmental protection legislation your government is choosing to ignore, so we can see what other laws you are above? Now that Danny Williams has left, it’s time for those ministers in charge to step out from behind his shadow and give some assurances to those of us who care about our environment that they care, too. I just wonder how long I’ll have to wait. The very first project to sanction will be the generating station itself and that should sanction sometime in 2011, that means that it would be under construction at that point. Never, ever, EVER send me anything by Purolator. 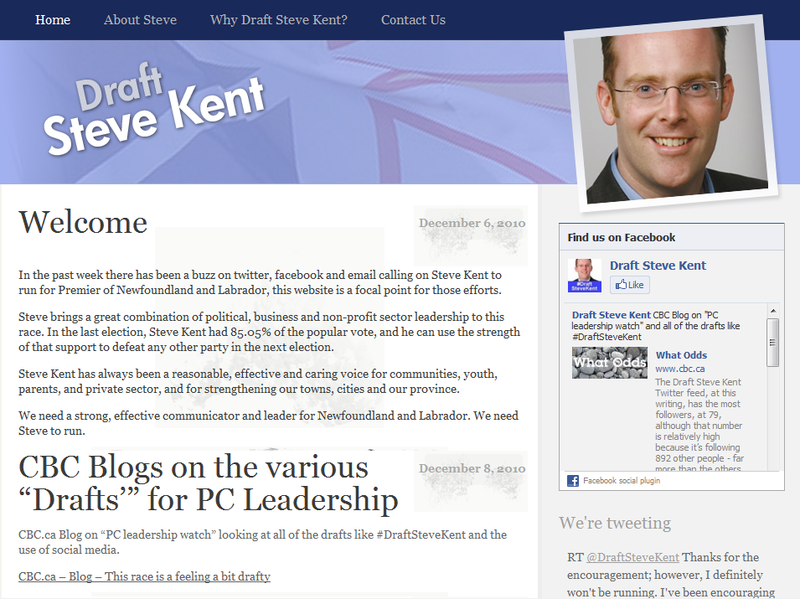 NTV also manages to get to the Labrador West weather-related story within 24 hours. No flies on those guys. The bad weather in central Canada is causing problems for motorists in Labrador West. The shortage is due to the inability of gas trucks to get to areas of Labrador City from Baie-Comeau. Roads to the area have been closed by heavy snow in parts of Quebec. 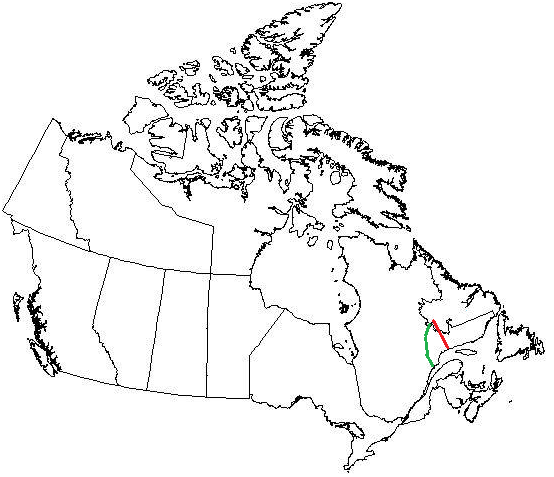 For NTV's future reference, here is a map showing Labrador and the road (green) and railway (red) which connects western Labrador to Baie-Comeau and Sept-Iles respectively, and whose disruption had economic consequences in Labrador City and Wabush. 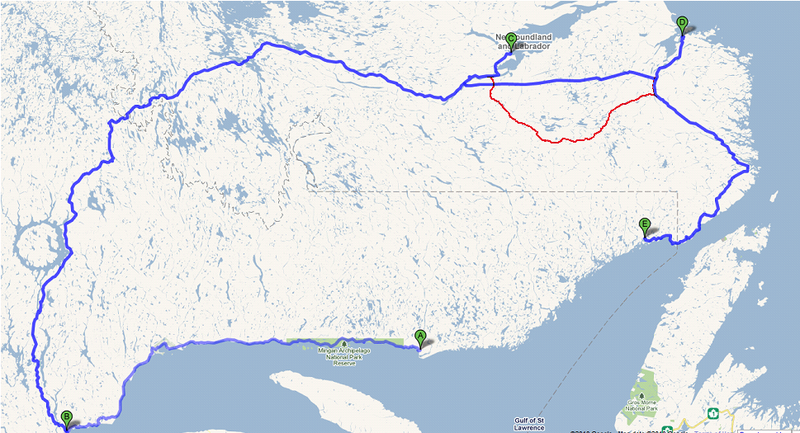 While, yes, those two towns are in Quebec, they are no more in "central Canada" than New Brunswick is. The sycophancy story of 2010 — at least until the game came crashing to a spectacular end — was the rise and rise of Jerome Kennedy. Sure, Susan Sullivan started the year strong, taking two monthly titles in a row to start the year. And in March, April, and June, Tom Hedderson showed some promise. But the rest of the year, from his tie in March to the five consecutive titles between July and November, Jerome was the man to beat. And no one did. Where once Dansportation and Works was the preferred Ministry of Toadies, under Jerome, Health muscled in and muscled the rest out. 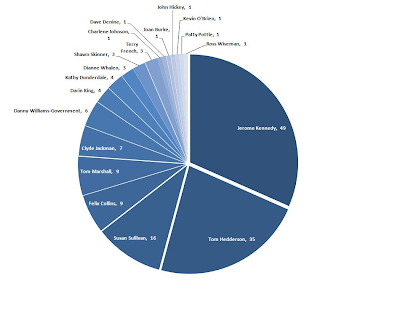 As with Trevor Taylor's career-finishing tally last year, with nearly 30% of the goals standing in his name, Jerome Kennedy, heir apparent, was responsible for a similar ratio of WilliamsGovernmentiness between January and that sad, sad, November day when it all came tumbling down. 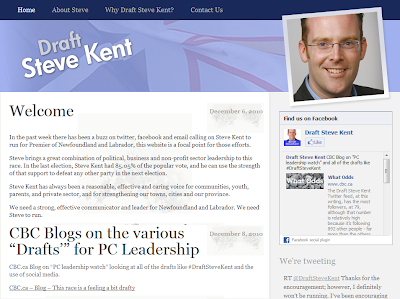 And as with 2009, 2010 saw some interesting episodes of sycophancy off the playing field. Whether it be a remarkably prescient press release in July, the official Williams Government paddywagon, the Western Star's remarkable editorial, or the contorted logic used to justify Our Dear Christmas Card, the suckuppiness reached a crescendo that will never again be matched. Perhaps next year Jerome will be the object of such affection. Can we look forward to five months of "Kennedy Government"? Do we dare? Your Sycophant of the Year for 2010, and for all time or at least for now — whichever comes first — Jerome Kennedy. Congratulations! And best wishes! Where you might have learned today that the QNS&L, a vital transportation link for western Labrador, has been shut down by the late rainstorm: Radio-Canada Sept-Iles. Where you wouldn't have: here, here, or here. Update: The Ceeb gets around to it. An earlier iteration of the story places it in "western Newfoundland". 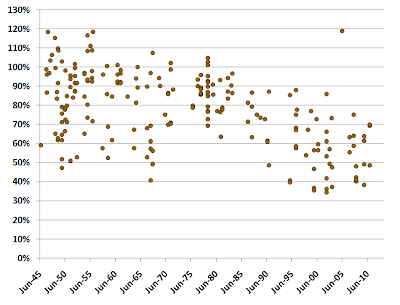 This chart shows a clever bit of figgerin' we'll call the Rubber Stamp Index, for each session of the Bow-Wow Parliament since the dawn of its internet age, ten long years ago. 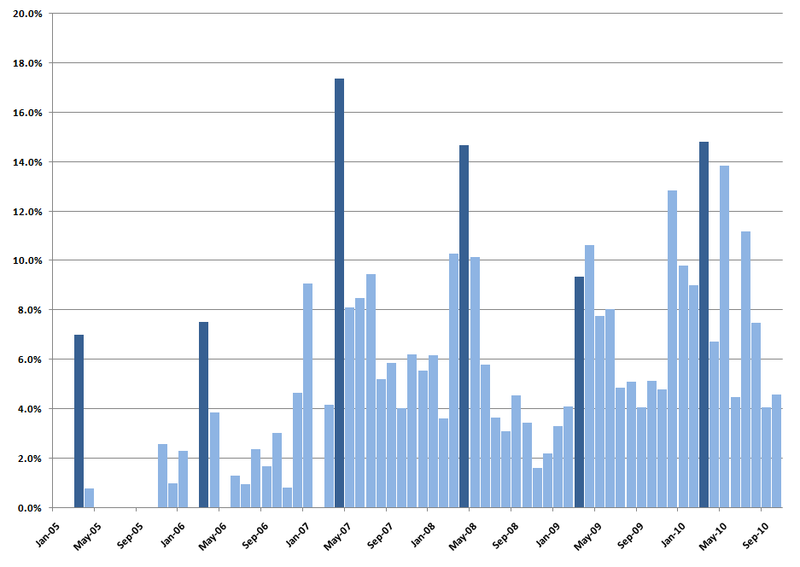 where A is the percentage of all bills which reached Third Reading before the end of the next calendar day after First Reading (in some cases, later on the first day); B is the percentage of all bills which passed Third Reading which did so without amendments; and C is the average number of calendar days between First and Third Reading. Bills which did not receive Third Reading are excluded from consideration. Data for the current session is provisional, and only includes bills which were introduced at First Reading before the six-month "summer" recess began in June. The higher the values for A and B, and the lower the value for C, the more rubber-stampery the session of the legislature. "For 100 years Abitibi-Consolidated had access to land, timbre [sic] and water rights in our province, along with a highly-skilled and dedicated workforce," said Minister Skinner. "Our government acted quickly to ensure the natural resources of our province were protected before this company abandoned its obligations to the people of Newfoundland and Labrador." Perhaps some time on Wednesday, an enterprising reporter will ask him: "protected those resources from what, Mr. Minister?" Perhaps an even more enterprising one will ask him, "but, sir, if those resource rights were, as your government has contented, contingent on the operation of the mill... wouldn't they have reverted to you anyway? So why did you have to expropriate in the first place?" Now, if only enterprising reporters had been around between November 2003 and November 2007. The Atlantic Provinces Economic Council has just released a document entitled, Outlook 2011 Conference Report: Are We More Powerful Together? [Ed] Martin updated the status of key elements in the Lower Churchill’s development, highlighting the project’s advances in several areas including: environmental and water management planning; preparations to award key engineering contracts; and negotiations with the Inuit people of Labrador. With only six offshore oil wells drilled prior to 2010, Phil Tracy emphasized the sparseness of exploration off Greenland and Cairn’s first mover advantages to being early into the area. Cairn has completed its first season of drilling off Greenland, where key concerns were the managing of the project’s safety, regulatory compliance and a thorough oil-spill response plan. Challenges presented by the project’s location off Greenland included the management of icebergs and logistics complicated by the necessity of moving personnel primarily by plane and helicopter, due to the absence of roads. Tracy said that there was a fair amount of public scrutiny of the company’s activity off Greenland, particularly in relation to the environmental impact and from concerns expressed by the indigenous Innu population. On Monday, St. John's City Council held its last meeting of 2010 — its 45th of the year. Also on Monday, the House of Assembly sat for the 48th day in 2010. This means that the House of Assembly has now met on more calendar days in the year than St. John's City Council, for, um, one consecutive year in a row. 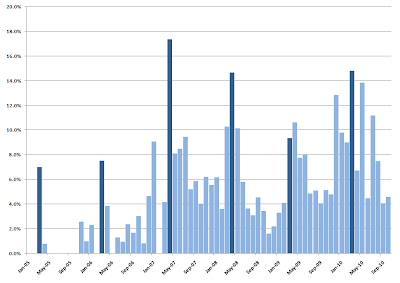 So far in 2010 (to Monday night) the House of Assembly has been out-sot by the Senate, which has met 76 times. 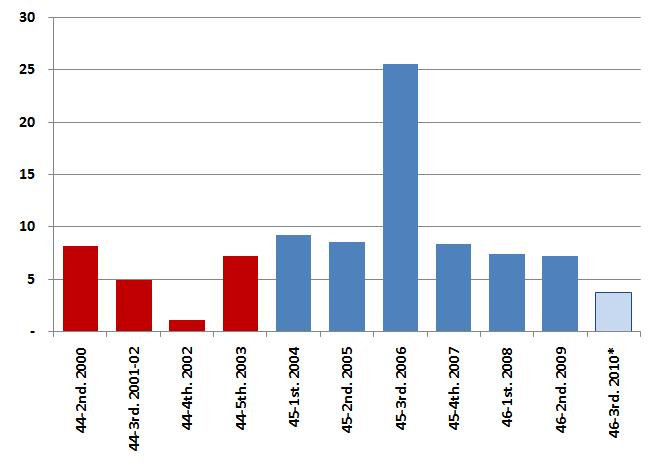 This is the fifteenth year in a row that the Senate has had more sittings than the House of Assembly. It has also been out-sot by two of three territorial legislatures (Yukon, 60 days; NWT, 51 days), making it the eighth year in a row that at least one territorial legislature has out-sot the Bow-Wows. As recently as 2007, all three territorial legislatures had more sittings than the House of Assembly. 2002 was the last time all three territorial legislatures met fewer times than the Bow-Wows, a provincial legislature. The good news: Google Maps finally shows Phase III of the Trans-Labrador Highway, connecting southern Labrador to the Goose Bay area. The blue line shows the highways in Labrador and neighbouring parts of Quebec, including the erroneously Google-straightened Phase III. The actual routing of Phase III, which meanders considerably farther south, is shown in red. Also shown are the existing route 389-500 axis from Baie-Comeau to North West River (B-C), the coastal highway from Cartwright to Old Fort Bay (D-E) and the North Shore highway from Baie-Comeau to Natashquan (B-A). The Lower North Shore gap remains as tantalizingly near, and far, as ever, even if it is now possible to drive, the long way, from Old Fort Bay and points east, to the rest of Quebec... via Labrador. It is an interesting and sad commentary both on the House of Assembly, and on those who study and cover it for a living, that the most insightful reporting and analysis on the goings-on in that august body, for many years, has come from a four-day field-trip by a MUN poli sci undergrad. What Now Said: It's a phrase......get on with something important! Trt Said: People need to get a life here in newfoundland it is only a Christmas card. Patti Said: I voted No. Maybe "Lest we Forget" in this instance means Danny telling us "Don't forget what Canada did to us over the years that I fought so hard to undo, and continue the good fight." Get over it! Said: My goodness people..GROW UP! Every day you guys manage to find something foolish to complain about. It's a Christmas card for god sakes! Danny Fanny Said: i agree, we shouldn't forget. neither what our veterans did on all our behalves nor what Mr. Williams a.k.a. Danny has done for this province. he's made sacrifices for us as well. Gonna miss you Mr. Premier. Best of luck in the future. Jimmy Said: Get over it.I will never forget Danny and what he done.I hope nobody else does either.looks good. Jane Doe Said: Thank God for Google. The phrase Lest we Forget comes from the poem Recessional by Rudyard Kipling. It was written for a queen and expresses pride in the British Empire but then expresses an underlying sadness that the Empire might go the way of all previous empires. (Sound like Nfld. and Labrador?) Only in later years was the phrase linked with Remembrance Day and found on war memorials. Lest we forget is NOT exclusive to war vets. So Danny did nothing wrong and has nothing to apologize for. John Smith Said: Only a moron, and I mean a true moron would associate this photo with the War memorial. I have seen many phtos with this in the background, it's the lobby of confederation Bldg. for god's sake! Where should a pic have been taken. lorraine was always at the bottom with me, and now she has slipped lower than that. RDM Said: The words are just backdrop from the Confederation Buidling Lobby…get over yourselves!! It's Christmas. Themove Said: Lorraine Michaels is being childish about this. WHO CARES? It's just a Christmas card. Just a thought... Said: I can't believe the comments on here, its crazy. Its a card for heavens sake, a Christmas and Fairwell card from the Premier. Who cares whats in the back ground, no matter what was there, someone is going to have a bad remark about it. Lest we forget Said: "Lest we forget" anyone who done any good for us or made us stronger & better people....Danny William, you are certainly one of those people!!! I can't believe I even read this in the news!!! Lady, shut up, it's a picture. Find other ways to occupy your time. Claire Said: I think this is a bit extreme. Yes, we use the phrase during Rememberance Day, however, it's not something we can only say on that occasion. The fact that it's in the background is arbitrary and it shouldn't matter one way or the other. Your point is moot Lorraine so move on. A Christmas card is a Christmas card so who cares. David Locke Said: I think Danny just wants the people of NF and Lab to remember what they have accomplished in the past ten years. Danny has to be the best primer that NF and Lab has ever had and just what can be accomplished when the priorities are kept in focuse. Ashley Phillips Said: It's only 3 words. I think the way Danny pulled Newfoundland out of the hole is well enough to remember. The other MHA's should take a page out of Danny's playbook and not forget. Steve Said: Oh friggin' boo hoo, he happened to be standing in a location in the confederation building that happened to have those words as the background, I wish all the whiners would get over themselves. All the blustering is mainly being done by the loud mouthed Danny-bashers and gossip mongers who should STFU and get a life. I am very scared myself that we will forget. We cannot slip back into the state of stupor we were in for 53 years before Premier William's arrival, that which saw us elect Politicians and immediately put them on auto pilot for the 4 year term for which they were elected. During those auto pilot spells they Gave Away the Shop in the name of our Raw Natural Resources and thus the resulting give away of our Human resource because our people had to follow the Raw Natural Resources to find work in the smelting, processing, refining and manufacturing industries which were created in other parts of Canada.Do the Opposition parties want us to remain in that wretched stupor state for the rest of our lives? It appears to me that is what they want. They don't want us to have a voice. It's easier to conduct Goverment dealings when you have the voice of the electorate silenced. Thank You Premier Williams. Please hang on to Premier Williams' Memory Lest we forget! Lest we forget! Give Danny a break, it's only a Christmas card. He did good while he was serving as Premier, and he will be remembered!! "Lest we forget" is a phrase people. It can be used during anytime of the year under any circumstance. It just so happens we use it in November for the lost and loved soldiers. Big deal if Danny used it in his Christmas card! Do you want some cheese with that whine? Seriously guys? The picture is from his farewell speech. Every time there's a press conference in the lobby of the Confederation Building it's either in front of the doors that lead into the lobby or in front of the War Memorial. "Lest we Forget" is not in any way referring to Danny, it just happens to be on the wall behind him. Lest We Forget is a phrase that can be utilized to memorize any monumental event of important. The War Dead will not be hurt by using the phrase that hear usually when we commemorate our them for their Monumental Effort in both Great Wars. Our War Dead fought for Equality and Parity among all, so that every family could be secure in shelter and food and free from discrimination. It was also a Monumental Effort and Event for Premier Williams to get the message of Newfoundlanders and Labradorians out there to Canadians and the World, that Newfoundland and Labrador's Raw Natural Resources and its Human Resource were both being utilized by other parts of Canada and the World to grow buoyant economies while our province languished as the "Have-Not" province of Canada, simply because our resources were utilized by others for their economies. "Have-not" status was a title that the province of Newfoundland and Labrador never should have had to be tagged with and thus burden given its bountiful resource base and great geographic location in Canada. LEST WE FORGET! LEST WE FORGET! LEST WE FORGET! Given the Thumbs down on this site the Opposition Members are out in full force. Also we should be able to garner from that very fact, that should they get control of power in Newfoundland and Labrador, it won't take them long to put us back in the "Have-Not" status position we languished in for the full 53 years before Premier Danny Williams arrived on the scene. They can't wait to take the Easy Raod and give everything away once again. Lest We Forget is a phrase that can be utilized to memorize any monumental event of importance. The War Dead will not be hurt by using the phrase "Lest We Forget" that we hear usually when we commemorate them for their Monumental Effort in both Great Wars. Our War Dead fought for Equality and Parity among all, so that every family could be secure in shelter and food and free from discrimination. It was also a Monumental Effort and Event for Premier Williams to get the message of Newfoundlanders and Labradorians out there to Canadians and the World, that Newfoundland and Labrador's Raw Natural Resources and its Human Resource were both being utilized by other parts of Canada and the World to grow buoyant economies while our province languished as the "Have-Not" province of Canada, simply because our resources were utilized by others for their economies. "Have-not" status was a title that the province of Newfoundland and Labrador never should have had to be tagged with and thus burdened with given its bountiful resource base and great geographic location in Canada. * Hi, Agnes N.! How ya doin'? Kerry McCarthy (Bristol East) (Lab): As someone who claims to be an avid fan of The Smiths, the Prime Minister will no doubt be rather upset this week to hear that both Morrissey and Johnny Marr have banned him from liking them. The Smiths, of course, are the archetypal student band. If he wins tomorrow night’s vote, what songs does he think students will be listening to: “Miserable Lie”, “I Don’t Owe You Anything” or “Heaven Knows I’m Miserable Now”? The Prime Minister: If I turned up, I probably would not get “This Charming Man”. If I went with the Foreign Secretary, it would probably be, “William, It Was Really Nothing”. An amendment to the Consumer Protection and Business Practices Act will remove expiration dates and fees for gift cards. The Department of Government Services has put forward Bill 40 which ensures consumers know the exact rules and limitations when purchasing gift cards. "Many consumers prefer to give gift cards because of their ease and convenience," said the Honourable Harry Harding, Minister of Government Services. "For this reason, it is important that consumers know exactly what they are purchasing and that they do not feel constrained to use them within a certain period because of time limitations." 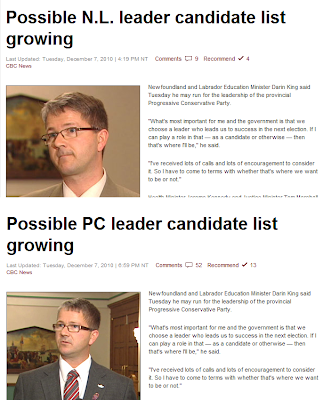 Unoriginal, because Newfoundland and Labrador is the last of the ten provinces to bring in such legislation. The first was Ontario, in 2007. Which, by happy coincidence, was also the year in which Manitoba’s provincial whistleblower legislation came into force. Which makes it all the more curious that sad-sack Justice Minister Felix Collins continues to polish the turd that is former Premier Danny Williams’ long-since shattered promise to bring in provincial whistleblower legislation. The latest excuse? "The provinces that have it are undergoing the regular growing pains of new legislation. We are monitoring that to see what best practices come out of it. So when we produce our legislation it will be the best piece of legislation that we can possible come up with." Why the casual wait-and-see attitude on whistleblower protection legislation, which has existed in Canada for just as long as gift-card protection legislation? In 2009, former premier Danny Williams reiterated his government's promised to create the legislation. "Well, you know, the whistleblower legislation, we want to do right," said Williams, who also said government is taking its time on Green's recommendation because it wants to do it properly. Williams committed to bringing in whistleblower legislation during this term in office, but would not specify when the public might expect to see it. At a campaign stop in Carbonear Oct. 6, Williams pledged that his government would implement whistleblower laws in the first session of the legislature after the election. "We'll get that on at the very earliest opportunity," Williams said in response to questions from reporters last October. This teacher needs a crash course in both history and geography. First, the province is more than an island. Second, the premier did not deliver all this prosperity – despite attempts to take credit for same, in his boastful farewell speech. Speaking of Liam. He just informed me that his class is writing a farewell letter to Danny William's thanking him for his contribution to the province while Premier. Liam though it was strange that his class was thanking Danny Williams for leaving. I chucked, thinking of a few people who might be able to draft that one. I had to explain to him that the letter was thanking him for a job well done and that he is retiring. Kids say the darnedest things. 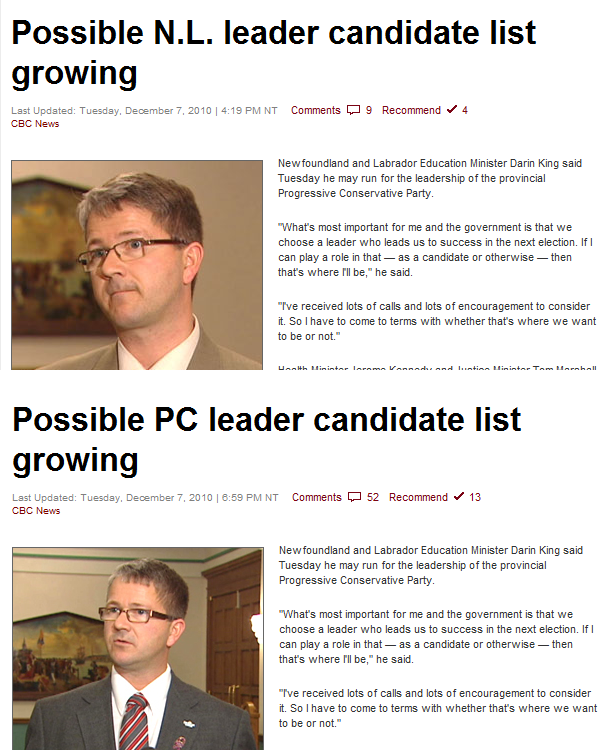 I wonder how many school children from Nain to Cape Ray are writing letters to Danny? I also wonder how many school children did that when Clyde Wells and Brian Peckford resigned? Turnout was 32.4% in Vaughan, 30.8% in Winnipeg North, and 26.9% in Dauphin, for an overall average of 30%. This is comparable to the 31.1% we saw in the last round of by elections and slughtly below the average of 34.2% we've seen since 1998 - 34.2% is also the average by election turnout in the Harper era so, despite lackluster excitement in the last two rounds of by elections, there's not strong evidence of a long term decline in by election turnout. Which is true enough... unless you change your definition of "long-term" so that it has a longer, um, term. in fact, since the end of the Second World War — see, long-term — by-election turnout has been on a steady downward slope. Now, there is a bit of a problem in examining election turnout generally, since the method of compiling voters lists, and thus of calculating the denominator, has varied over time as election law and practice has changed. Some of the supposed decline in turnout in the last two decades may, in fact, be attributed to phantom electors whose presence on the "permanent" voters list skews the calculation of "turnout" in the normal sense of the word, votes cast as a percentage of voters on the list. 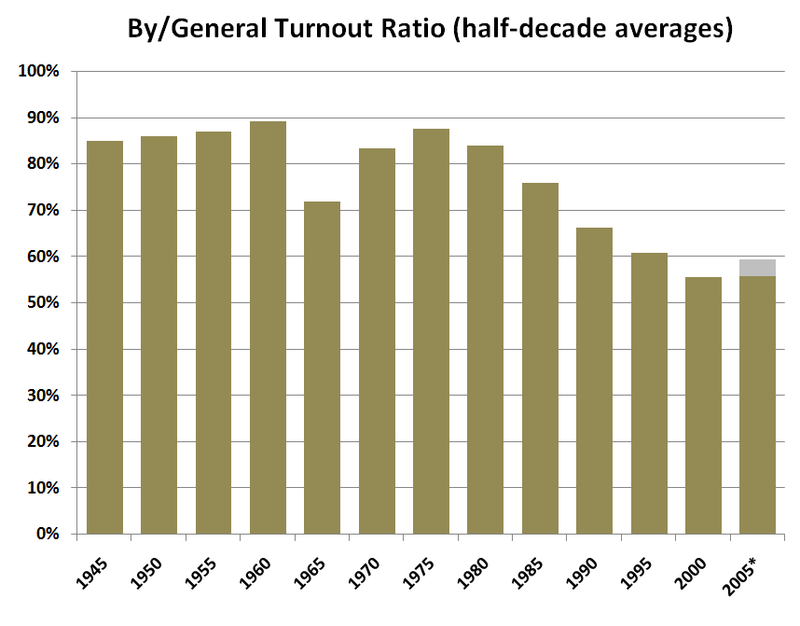 To try and elminate this variability, consider by-election turnout as a percentage of the previous general election turnout in the same riding. If, for example, 10,000 people voted in Merasheen–Mécatina in the 1993 general election, and 9000 did in the 1995 by-election in that riding, the turnout, on this measure, is 90%. 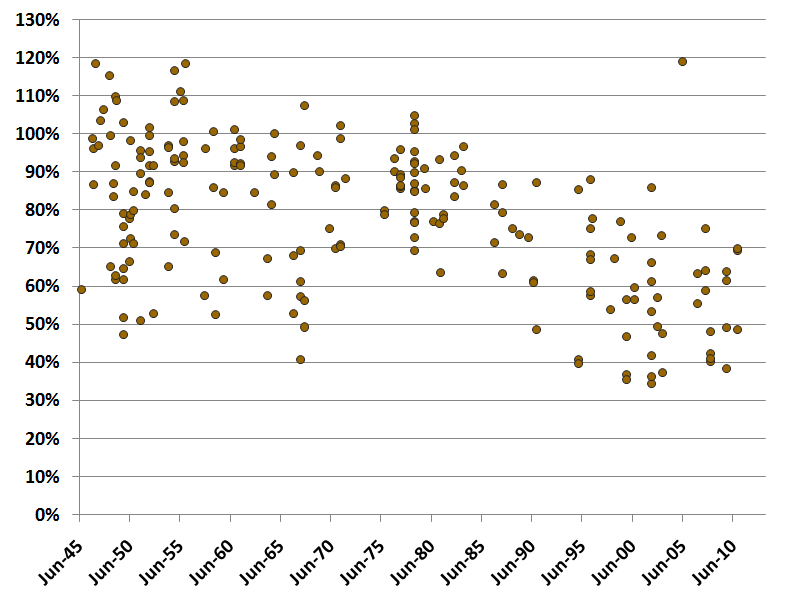 This scattergram shows the 209 contested(A) federal by-elections since 1945 plotted chronologically left to right, with this definition of turnout plotted vertically. The result is striking. The turnout range, and both its upper and lower limits, have sloped downwards over the years, and especially since the late 1970s. On the bottom end of the range, there have also been 22 by-elections where this kind of turnout has been less than half that of the preceding general election. Of those, 13 have been since January 1, 2000. Aggregated into half-decades starting in "0" and "5" years, it is apparent that the short "long-term" trend is that turnout has stopped falling, at least for now, in the first decade of the century. But that comes after three decades of relentless decline of roughly 1% per year. This graph shows the average turnout of the by-elections held in each of those five-year periods. The figure for the half-decade starting in 2005 includes the by-elections held in 2010. The effect of the "outlier" by-election on the 2005 half-decade figure is shown in grey; without it, the most recent half-decade result would have been only 0.1% higher than the first half of the 2000s. (A) There were also a small number of by-elections by acclamation, which are not considered here. (B) Until 1966, there were a small number of dual-member ridings. Where by-elections were held to fill one seat in a dual-member riding, by-election turnout was calculated as a share of half the turnout of the previous general election. 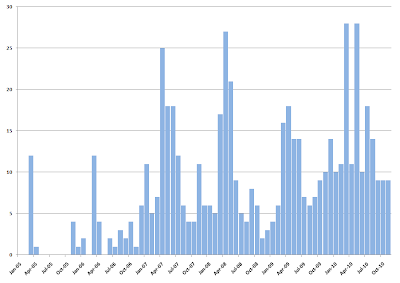 Total number of ProvGov press releases issued in November: 181 (-15 from October). Total number with the phrase "Williams Government": 9 (no change from October). Sycophancy index: 5.0% (+0.4% from October). For the second month in a row, the number of WilliamsGovernmenty releases was unchanged at nine, and for the second month in a row, the Sycophancy index went up as total pressreleasey output slumped again by 15 to 181. And for a second month in a row, Jerome Kennedy, defending his title, was first out of the gate, on November 3rd, then the 4th, then the 5th. On that latter date, Tom Hedderson blocked JK from the shut-out. On the 10th, Himself WilliamsGovernmented Himself without a hint as to what would follow. On the 13th and 15th, Jerome cemented his lead. On the 18th, Felix Collins became just the fourth name on the monthly board. On the 22nd, Jerome rubbed everyone noses in it. For the fifth month in a row, and for the final time, your November Sycophant of the Month, Jerome Kennedy! The Provincial Government today announced two new energy initiatives in select coastal Labrador communities designed to identify potential alternative energy sources for isolated diesel communities. These programs will assist residents and businesses to conserve energy and better manage their consumption. "These energy efficiency initiatives will identify technically-sound alternative energy options and useful ways to conserve energy in the communities where these initiatives are taking place," said the Honourable Kathy Dunderdale, Minister of Natural Resources. "The programs will also provide valuable information that can be used in communities all along the Labrador coast. These investments are focused on maximizing our energy resource potential in these communities and assisting property owners to lower their energy costs through reduced consumption." The initiatives were announced by Minister Dunderdale and the Honourable Patty Pottle, Minister of Aboriginal Affairs, at a news conference in Happy Valley-Goose Bay. The ministers are on a two-day tour of northern Labrador that includes a visit to the Voisey’s Bay mine site. The Honourable Joan Burke, Minister of Education, will also participate in the tour. Both projects announced today are being undertaken by Newfoundland and Labrador Hydro (Hydro) and will be completed by the end of 2009. The Provincial Government is spending $500,000 to conduct an alternative energy study and an energy efficiency community pilot project in coastal Labrador communities. The funding is part of the $13 million allocated in Budget 2008 for implementing key Energy Plan initiatives. In keeping with the provincial government’s agenda of developing resources for the maximum benefit of the people and continuing on the road to self-reliance, Premier Danny Williams announced today the Government of Newfoundland and Labrador and Newfoundland and Labrador Hydro (NLH) will take the lead on the potential development of the Lower Churchill hydroelectric resource. The decision was made following the assessment of the proposals short-listed from the Expressions of Interest and Proposals (EOI process). While Hydro will take the required time to complete due diligence on the feasibility of this project, a planning schedule has been developed that will see a project sanctioning decision by 2009 and potentially first power by 2015. The Lower Churchill is just around the corner. It always is. One of the happier results of Our Dear Departure from politics today, still pink and warm, is that the O'Brien Protocol, formulated for the other possibility, now won't have to be implemented. So you have to get to each one of the doors. You have to do that, and you have to talk to people when you are out. I do it myself in regard to when I am out to the grocery stores and whatnot, and I try to remind them, because God forbid, if we lose the leadership that we have right now, that is certainly the envy of all of Canada, as I have travelled within the country itself, I have heard time and time again: God, we wish we had a Premier like yours. So God forbid that we would lose him as a leader at this particular time. I will say this, that some point in time, I suppose a lot of people expect that we will lose him, but my idea of it all is that we should mummify him and keep him in the seat and do not let anybody know in Newfoundland and Labrador that he is dead. I think under just having him here, we will do much better than if we had somebody else in that chair. So I will say that there as well. I have said that, actually, publicly at times. I say it with some type of jest, because I am not sure if he would want to be mummified and put in that chair, but in the meantime, I would like to have him there myself, because I have all the admiration in the world. In the past year or two, someone has been making the claim that Danny Williams, in addition to doing things like lifting Corner Brook out of a dormant state, and exhorting the sun to rise every morning, struck the deal with Inco (as it then was) to develop Voisey's Bay. Throughout that past year or two, there has been a steady parade of the gullible and the facile — hey, John Ibbitson, how ya doin'? — willing to accept this historical revisionism as Gospel According to Dan. Of course, Nothing Could Be Further From the Truth™. The Voisey's Bay Statement of Principles was reached in June 2002, followed, wonder of wonders, by a special debate in the House of Assembly, with the legal text hammered out and actually released to the public in October. That is, more than a year before Danny Williams was sworn in as Premier. Which brings us to Danny Williams' much-hyped "improved" Voisey's Bay deal. The man who promised "no more giveaways" and "no more secret deals" issued a press release on his "improved" agreement. But, quite conspicuously, and apparently unchallenged by the press or opposition, not the "improved" agreement itself. However, as Mr. Orwell reminded us all in 1984, for a certain class of governor, it is insufficient to merely re-write the history. You must also take great pains to eliminate those records of the past which might contradict your version of history as re-written. has been consigned to the virtual dustbin of history, leaving nothing but ghost press releases (and a mine and mill and a refinery now building in Placentia Bay) to witness that it ever existed. A multi-billion-dollar project, once a matter of public record, has successfully reverted to the status of state secret... thereby joining every single resource agreement reached during the seven-year Danny Williams Era. A fascinating look into the mindset of a political cult today, courtesy an Ashley Fitzpatrick report in the Telegram about PC Youth's plans for one more — one hesitates, with good reason, to call it one last — expression of undying love and admiration for Dear Leader. "Premier Williams has been a very big supporter of the youth in the province as well as the youth in the Young Progressive Conservatives in Newfoundland and Labrador," [Erin Skinner] said, adding she feels the premier has also renewed a sense of provincial pride, an action that deserves an expression of thanks. "Thanks for putting Newfoundland + Labrador back on the map Danny. Thanks to you, the rest of Canada now realizes that we actually exist both as a province and as individuals," wrote [Facebook] page visitor Waylon Spencer. "Thanks for being the best Premier that have ever been in politics and a great Newfoundlander besides. You make all Newfoundlanders proud," wrote Connie Chaisson. Not only, as per the old talking point, were We ashamed before Danny came along and gave We pride, Danny breathed life into We, because We didn't even exist. Robert Rowe bravely makes an under-made point. • Promote industrial development and meet domestic energy demand in Labrador and then on the Island of Newfoundland. • Keeping real program spending constant by limiting the annual growth in spending to the anticipated growth in inflation. New needs that arise will be accommodated within this budget constraint. • Approximately 40% of all government expenditures goes towards salaries and employee benefits. Over the next five years, approximately 25% of the public service will be eligible for retirement. A Progressive Conservative government will use this five-year period to reduce the size of the public sector through attrition. During its first mandate, a Progressive Conservative government will make it illegal for government to spend money without prior legislative approval when the House of Assembly is in session, and restrict spending by Special Warrant to a specific emergency that occurs when the House is not in session. • The election of an independent speaker, who will not sit in a caucus or be eligible for a cabinet appointment during the term of a legislature over which he or she presides. • Require full disclosure of contributions and expenditures in party nomination contests and elections. • Require disclosure of contributions to leadership campaigns as they occur and disclosure of independently audited expenses within three months after the election of a new leader. • Set and publish content rules for government advertising that will stop the use of public funds for political advertising. • Proclaim new Freedom of Information legislation which will include amendments that will clearly identify information that should be in the public domain, including cabinet documents, and will require full and prompt disclosure of the information to the public. • Release to the public every government-commissioned report within 30 days of receiving it, indicate the action government will take on a report's recommendations within 60 days, and ensure prompt public access to all government reports in hard copy and on the Internet.